The Lifesaving Society is a full-service provider of programs, products and services designed to prevent drowning. We save lives and prevent water-related injury through our training programs, Water Smart® public education, aquatic safety management services, lifesaving sport and water incident research. 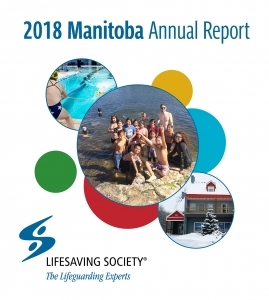 The Lifesaving Society – Manitoba Branch was founded in 1911, and we have been proudly saving lives and educating Manitobans about water safety for over 100 years. We train all of Manitoba’s National Lifeguards. Through Swim for Life, the Canadian Lifesaving Program and First Aid and CPR programs, Manitobans develop personal swimming and survival skills together with water rescue and first aid knowledge. Take a course today! The National Lifeguard award sets the standard for lifeguard training in Canada. It is listed in the Manitoba Public Health Act as one of the legal requirements to be a lifeguard in Manitoba. This program focuses on the professional responsibility required to prevent drowning and water-related incidents, and to rescue others. The NLS award is the only nationally recognized lifeguard-training program in Canada. Instructors, examiners and instructor trainers provide leadership for the Society’s lifesaving, lifeguarding, first aid and CPR programs in communities throughout the province. Recognizing that many people never enroll in swimming or lifesaving programs, the Society created its Water Smart® campaign to deliver personal water safety information and lifesaving education to Manitobans. The Northern and Remote Water Smart® Project brings personal swimming & survival skills, boat operator training and first aid training to northern and remote communities in Manitoba. Learn more about how you can be Water Smart! The Society conducts research in areas that support and lead to improvements in its program education and public education initiatives. Since 1992, the Society has researched and reported on drownings and unintentional water-related deaths nationally. The Society uses this information to analyze the drowning problem in detail and to better understand what needs to be done to reduce the number of drownings in Manitoba. The results are published in our drowning reports. The Society provides advice to education, recreation, health and government agencies that oversee aquatic recreation and first aid certification and training in Manitoba. In addition, Society representatives may act as expert witnesses at coroners’ inquest and in court cases. Lifeguard competitions are one of the best forms of professional development for lifeguards and are a fun way to practice skills. Competitions include a wide variety of activities such as first aid, water rescue, victim assessment, relays and emergency situations. Our Annual General Meeting takes place in the spring, and all Lifesaving Society members are invited. If you hold Lifesaving Instructor, Examiner, Trainer or National Lifeguard awards and are 18 or older, you are a voting member of the Branch! We encourage you to attend to stay informed about your Lifesaving Society branch. Notices of the AGM will be posted on our website. In the meantime, read about updates and highlights for the previous year in our 2018 Annual Report. Each year, more than 1,000,000 Canadians participate in the Lifesaving Society's swimming, lifesaving, lifeguarding and leadership programs.